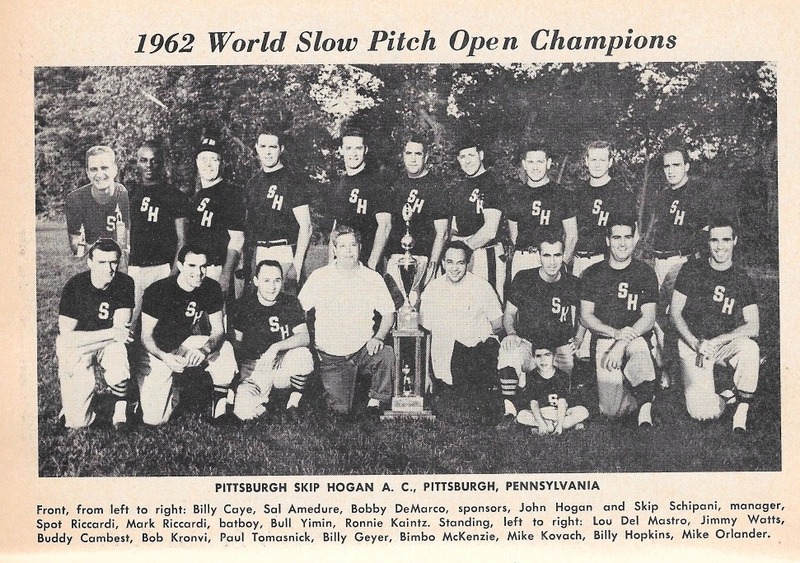 1962 held at Cincinnati, Ohio. After Dana Gardens Pitcher Dot Bailey got Rutenschrorer out with no runs after they loaded the bases in the first inning. The Dana Gardens defense turned the first of their 4 double plays in the game. Norma Eschenbrenner and Alberta Kohls had back to back hits to ignite Dana and get them started as they scored 6 runs in the first inning. Dot Bailey surrendered only 5 runs in her 5 pitching victories, three of them by shutout. On a side note, Dana Gardens defeated Rutenschrorer to win the Cincinnati Metro crown the week prior. NOTE: this is the only information available on the consolation flight. no results, no scores, just the Championship Game score. 1962 (final records incomplete) W-L Pct. 1963 (final records incomplete) W-L Pct. with a slow pitch team. 1966 (final records incomplete) W-L Pct. – Chadwick Construction, Meridan, CT 2-2 . – Stantons, Mount Vernon-Westchester, NY 1-3 . NOTE – No info on any games, just who was entered, Musicaro withdrew before the season. 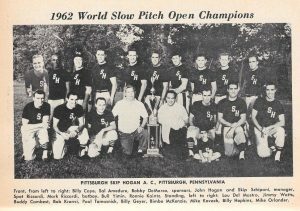 1962 held at Cleveland, Ohio. Plateau AC eliminated Sheffield Bronze 6-5 on a walk-off single by George O’Neil. Then East Side Sporting Goods, behind the hot bat of Bill Cole (triple and single) eliminated Plateau AC 5-1 to reach the final. Paul Tomasovich electrified the crowd in his first at bat when he hit a home run over the 30 foot high fence in right center. Detroit came back with Bill Cole’s double being the big blow to take a 4-1 lead. The Pittsburgh crew came back in the 5th inning as Ron Kaintz and Mike Kovach both had back-to-back run scoring singles. They both scored on Jimmy Watts’ triple tying the score at 4 each. Skips winning run came in the 6th as Mike Orlando’s double plated Billy Caye who had singled. Bimbo McKenzie chipped in with 2 hits, including a RBI Double. The magical pitching of Lou Del Mastro kept the Detroit bats quiet in the top of the 7th to preserve a 5-4 championship for Skip & Hogan. John Stone of Milwaukee set a new Home Run record with 11. Paul Tomasovich led Skip & Hogan for the weekend (12-18, .667, with 4 doubles, 3 triples, 2 HRs and 6 RBIs). Del Mastro (9-15, .600, 4 doubles, 4 triples, while scoring 10 runs) and Kovach (9-17, . 529). Skip Hogans finished the season with a 39-6 record.